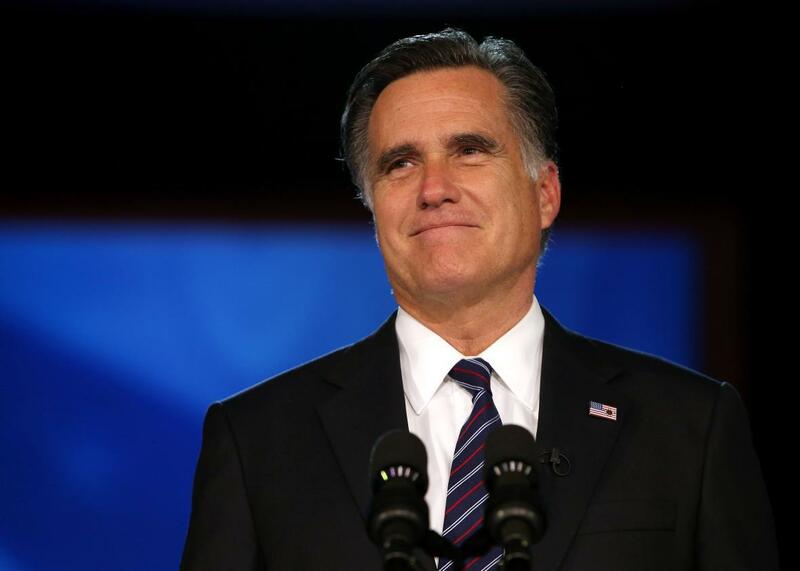 Mitt Romney speaks as he concedes the presidency on Nov. 7, 2012, in Boston. Well, that should fix everything. Mitt Romney on Thursday gave what amounted to a keynote address for the nascent #NeverTrump movement, calling Donald Trump a “fraud” and warning of the dire consequences for the Republican Party and the nation at large if he does win the nomination. On paper, Romney’s criticism is a powerful act; here is the most recent GOP nominee trying to take down a man who is well on his way to becoming the next one. In reality, though, it’s likely to be too little, too late—and is more than a little hypocritical to boot. As Trump doesn’t hesitate to remind everyone, Romney went out of his way to seek his endorsement in 2012, well after the reality television star was beating the Birther drum. Romney was fine with Trump’s demagogy when the former Massachusetts governor thought it would help put him in the White House. It’s only now that the Donald is using it for his own political purposes that Romney is taking a stand. Undercutting Mitt’s anti-Trump pitch further is the fact that he still hasn’t endorsed anyone, a nondecision that my colleague Isaac Chotiner points out suggests Romney is leaving the door open to play white knight at a contested convention. In that way, he’s not unlike Trump’s 2016 rivals who have refused to sacrifice their own slim presidential prospects for the greater good of their party. Nevertheless, I don’t want to dismiss Romney and his anti-Trump allies completely. Donald Trump is the clear front-runner for the Republican nomination, but he’s not the presumptive nominee just yet. He’s won 10 of the 15 GOP nominating contests so far, but he still only has about a quarter of the 1,237 delegates necessary to secure the nomination. With Florida and Ohio’s winner-take-all primaries less than two weeks away, though, it’s a now-or-never situation for those in the GOP establishment who so desperately want to defeat him. Stopping Trump in Florida is the first step in a multistep plan to force a contested convention—a break-in-case-of-emergency option that Romney suggested is now the only one. “Given the current delegate selection process, that means that I’d vote for Marco Rubio in Florida and for John Kasich in Ohio, and for Ted Cruz or whoever has the best chance to beating Mr. Trump in a given state,” he said. Romney’s an imperfect messenger, but he’s not a horrible one. CNN, MSNBC, and Fox News all carried portions of his speech live—something they do far more frequently with Trump’s campaign events than they do with those of his rivals. Of course, expect those same networks to have their cameras rolling this afternoon at Trump’s campaign rally in Maine, where he’s sure to offer a Trumpian rebuttal.